Wayne Rooney netted his first goal since April as a Manchester United side saw off stubborn resistance from League Two Macclesfield. Rooney, skippering United for the first time, cleverly flicked Paul McShane's shot into the bottom corner with an inspired touch from his right heel. But Danny Swailes levelled for Macclesfield shortly afterwards with a powerful shot from inside the box. But Frazier Campbell shot home on 72 minutes to give United victory. The match represented Rooney's first appearance since he was sent off in England's World Cup quarter-final defeat to Portugal. And it was his first goal since netting a double at Tottenham in a 2-1 win in April. 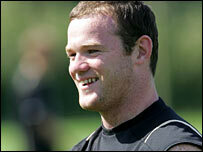 Manchester United boss Sir Alex Ferguson said: "Wayne produced some terrific moments. He has scored a goal as well, so I'm very happy for him." Ferguson fielded a largely youthful line-up, but included Rio Ferdinand and Edwin van der Sar in his starting 11. But the win was marred by a serious-looking injury to young midfielder David Jones who was taken to hospital for an X-ray on a suspected broken arm.